India's capital on Thursday declared a pollution emergency as toxic smog hung over the city for a third day and air quality worsened by the hour. Indian commuters wear masks as they walk along a road amid heavy smog in New Delhi on November 9, 2017. India’s capital on Thursday declared a pollution emergency as toxic smog hung over the city for a third day and air quality worsened by the hour. Illegal crop burning in the farm states surrounding New Delhi, vehicle exhaust emissions in a city with limited public transport, and swirling construction dust have caused the crisis, which arises every year. A US embassy measure of tiny particulate matter PM2.5 showed a reading of 608 at 10am on Thursday when the safe limit is 50. PM2.5 is particulate matter about 30 times finer than a human hair. The particles can be inhaled deep into the lungs, causing heart attacks, strokes, lung cancer and respiratory diseases. “Waking up with a headache, breathlessness & throat irritation every day,” Bhavani Giddu wrote on Twitter. Many people stayed home and restaurants in some of the city’s most crowded parts were deserted. “I’d like to assure people that the central government shall do everything possible to bring about improvement in air quality in Delhi and the Nation Capital Region,” said federal environment minister Harsh Vardhan as authorities faced criticism for failing to take steps to resolve the problem. The haze covered India Gate, a war memorial in the centre of the city where Britain’s Prince Charles and his wife Camilla paid their respects on Thursday. The city would curb car use next week, said the state government, the latest attempt to clean the air. New Delhi will follow an “odd-even” scheme for five days from Monday onwards in which cars will be allowed on the roads based on whether their number plates are odd or even. “It is an emergency situation,” said Kailash Gahlot, Delhi’s transport minister. In other measures, commercial trucks have been banned from the city unless they are carrying essential commodities, all construction has been stopped and car parking charges raised four times to force residents to use public transport. Schools have been shut for the week. 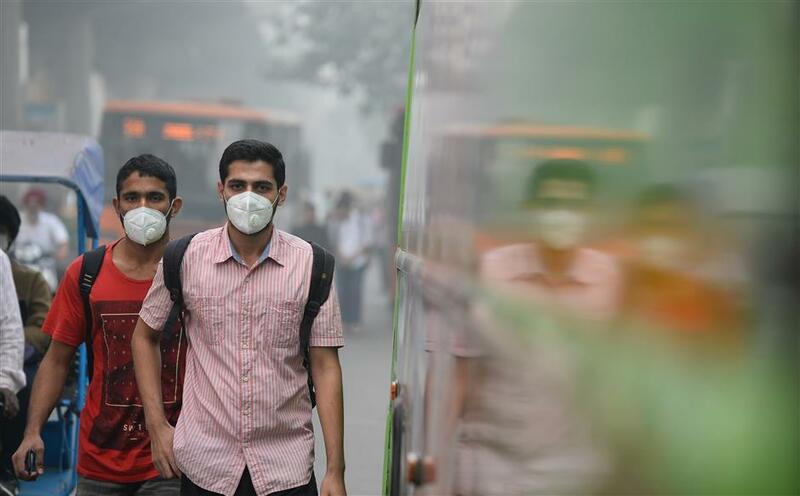 “There is such a cloud over us that you probably need artificial rain or some such to clear this,” said Dr Vivek Nangia, a pulmonologist at Delhi’s Fortis hospital. Video images showed farmers illegally burning crop stubble in Rohtak, about 65 kilometers from Delhi. Farmers in Haryana, where Rohtak is located, and Punjab, the two big agrarian states surrounding Delhi, burn millions of tons of crop waste around October every year before sowing the winter crop of wheat. State authorities say it is hard to enforce the ban unless farmers, a powerful political constituency, are given funds to buy machinery to clear their land.